As a woodworker, I’ve found we are often defined as either a “Hand tool” woodworker or a “Power tool” woodworker. There are others, like myself, who straddle the line between the two. These “Hybrid” woodworkers tend to mix the flavors of hand and power tool work for efficient shop time as well as other considerations. Since I’ve started incorporating more hand tools in my work, I’ve been building out my tool chest, incorporating various tools that enhance my work. One of the cornerstones of hand tool work are the hand planes, and some of the best wooden bodied hand planes on the market today are made by Scott Meek. On Saturday the 8th and Sunday the 9th Scott will be at Highland Woodworking offering a class on How to make your own Smoothing plane. In the two day class, you will spend time learning the fundamentals of putting together a wooden hand plane and you’ll leave the class with your very own wooden smoothing plane. After this class you can head back to your shop with your own completed tool and you can use it in your everyday shop life. But not only will you gain a new tool, you will gain new skills. With those skills you can build other planes, bringing more tools into your shop and hopefully, a sense of accomplishment as you make your own tools. I first met Scott at the Woodworking in America show this past September. We stood and talked for a bit and I was able to use some of his fine hand planes. With a wooden plane you get far more tactile feedback from the wood you are planing. Since there is no metal body to absorb the vibrations and the sensations from the surface, you are really connected to the wood you are working with. Between your hands and your work is a solid piece of wood that lets you feel the surface you are creating far better than metal bodied planes do. A few weeks ago I got to meet Scott again at the Highland Woodworking open house, where I got to test drive his planes some more as well as talk to him some about their construction and the evolution of their design. I also got to watch as woodworking legend Frank Klausz worked with Scott’s planes. His verdict was the same as mine, that Scott makes exceptional tools. 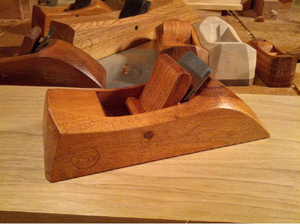 On Saturday I am looking forward to learning how to make exceptional tools like Scott’s hand planes. I personally have my eye on taking the skills I learn in that class back to my shop and crafting a jointer plane of my own. I like the idea of crafting my own tools; of taking the skills I have as a woodworker and using those to create something with both form and function. I hope, if you are able, that you look to join me at the class over at Highland Woodworking. I think it will be a phenomenal opportunity and teach a set of skills that will only grow after you return to your shop.